I’ve been a fan of Nigella’s writing since Nigel Slater (my other favourite cookery writer) gave his readers a tip-off about her first cookery book How To Eat. In fact, How To Eat was so beloved in our house that both my housemates had a copy – just in case we parted ways and one of the three of us would end up living without it. Together with all Nigel’s books and Darina Allen’s impressive Ballymaloe Cooking School Cookbook, How To Eat sits on that section of the cookbook shelf that gets plundered on a regular basis. While How To Be A Domestic Goddess is also a worthwhile and oft-used book, especially if I’m in the mood for night-time baking, neither Nigella Bites nor Forever Summer managed to set my world alight. Perhaps there was too much emphasis on Nigella the TV star and not enough on Nigella the cook. 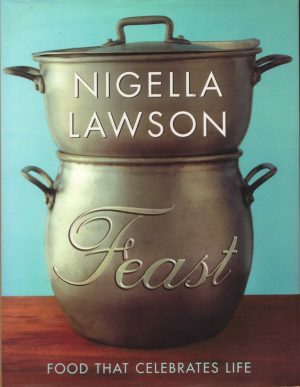 So it’s a relief to pick (or heft) Feast up and realise that, freed from programme constraints, this is Nigella doing what she does best; writing gloriously evocative and approachable recipes. It’s a dense tome of a book, which clocks in at almost 500 pages and has text that looks like it was sized down to make sure it didn’t take over another couple of hundred pages. Chapters range from well known celebrations that involve food – Christmas, Thanksgiving, weddings, Halloween – to those which may be a little more obscure, like Eid (the feast at the end of the Ramadan fast) and Rosh Hashanah, the Jewish New Year. Nigella mixes ethnic food (Gefilte Fish, Mughlai Chicken) with more traditional dishes (Simnel Cake, Shrove Tuesday Pancakes) and there’s even a whole mouthwatering chapter called Chocolate Cake Hall of Fame. The question has to be asked – does Nigella eat to live or live to eat? Considering the vast selection of recipes in Feast, it’s a wonder that she has any spare time outside food preparation and consumption to have a life at all. But of course she does, and a rather well-documented one at that – from the early deaths of her mother and sister to that of her journalist husband John Diamond and towards a new beginning with her second husband, multimillionaire art collector and advertising tycoon Charles Saatchi. Her domestic goddess career seems to have worked as a counterpoint to the sadness and loss in her life and she often mentions her mother’s cooking techniques or dishes that were particular favourites of her sister. There’s no sentimentality involved, thankfully, but it’s very clear that food, for Nigella – as for so many of us – is about far more than just physical sustenance. Thanks to publisher Chatto & Windus for the review copy of Feast: Food That Celebrates Life.